The VW V-Logger is a compact data logger designed to monitor four or eight (model dependant) vibrating wire sensors. It is simple to use and economical to deploy. The VW V-Logger is ideal for monitoring multilevel piezometers and multipoint extensometers. It is also useful for supplementing a larger, centralized data logging system. 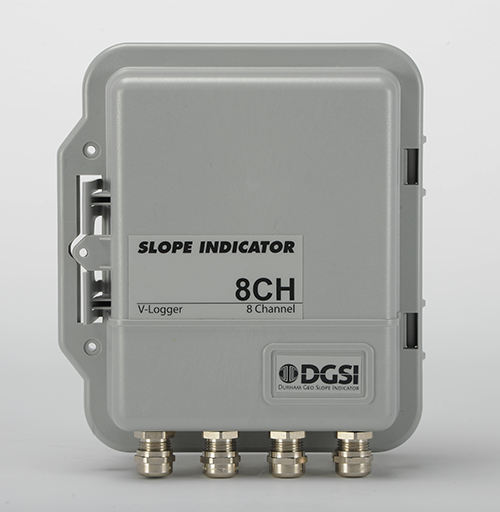 Simple to Use: Learn how to use the V-Logger in minutes, not hours. There are no programs to write and no switches to set. Cost-Effective: V-Loggers are the right size for many projects. It is possible to deploy two or three V-Loggers for less than the cost of a full-size logger, while significantly reducing cable costs and eliminating the need for complex programming. 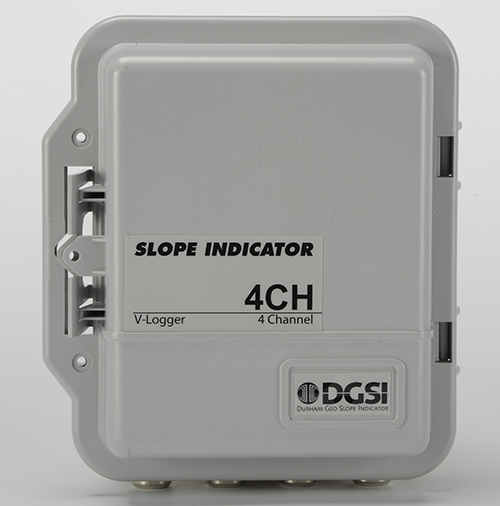 Reliable:The V-Logger is rated for temperatures from -40 to +85°C, and is IP68 rated. Readings are stored in secure, non-volatile memory. Flexible Communication Options: The base model of V-Logger features USB communication between the unit and the computer running the supplied Logger Manager program. Alternatively, an RS-232 option is available to allow connections to external spread-spectrum radios or cellular modems. Finally, the logger can be provisioned with DGSI’s custom Hermes radio, an integrated spread-spectrum radio designed with power management in mind. Atlas Compatible: The Manager software can also store data in a format that is compatible with Slope Indicator’s Atlas web-based monitoring software. Compact: The V-Logger measures 228.26mm H x 198.1mm W x 97.3mm D (9.0 x 7.8 x 3.83 inches). 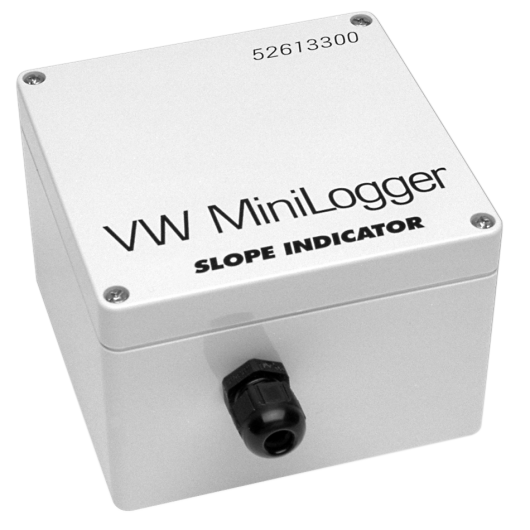 Please download the datasheet and the manual for the VW V-Logger. 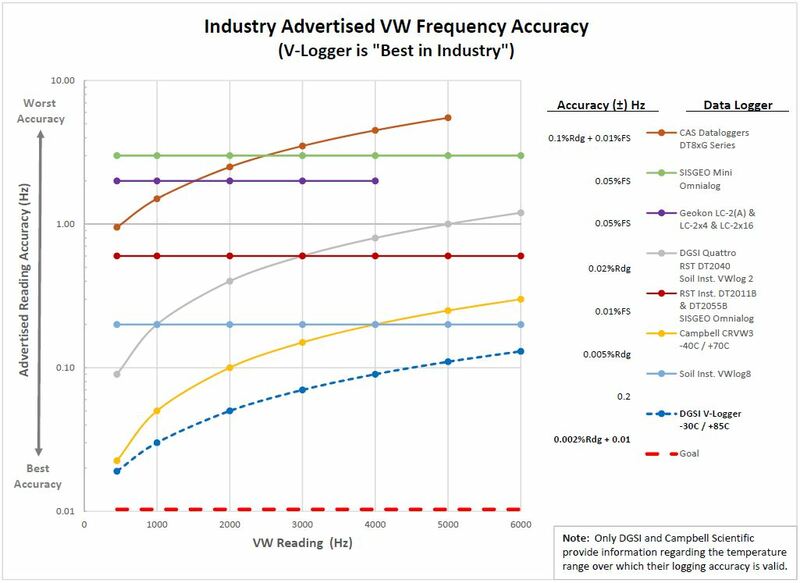 For further reading, also download the datasheet for the VW V-Logger Series with Spread-Spectrum Radio. You also might need to download the datasheet for the VW V-Logger Series with Spread-Spectrum Radio for China. These documents can be viewed and printed with Adobe Acrobat Reader.